Jack has put together another video for us today, where he describes how to clean and maintain pistols: both revolvers and semi automatics. I hope you are able to learn a few things or at least enjoy the video. 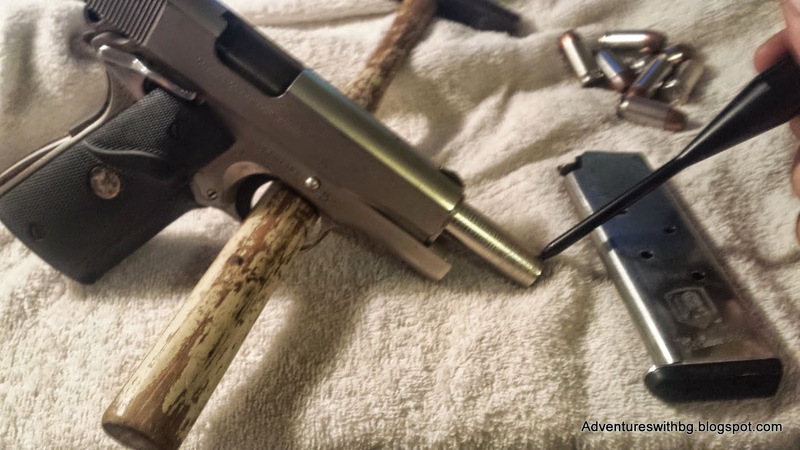 If you need help cleaning you rifles or shotguns, check out his cleaning guide. Or you can check out the video on The Adventures With BeeGee YouTube channel. Jack: Hey guys this is Jack with Adventures With BeeGee. I'm just gonna go ahead and do a quick pistol cleaning course real quick. Jack: So, first thing you guys are going to need is your eye pro. Never forget that. So, let's go ahead and put that on. Second, it would be a good idea to get a firearm. Then, go out and get yourself a little ramrod for 10 bucks. I recommend getting the rifle, the shotgun, and the pistol one. It's the all in one so you don’t have to go out and buy 2 kits or 3 kits. It's good to have a little toothbrush for cleaning. A rag or a triangle bandage. Your favorite cleaner. Mine happens to be CLP. Then, some cotton swabs or cotton cloth. So, go ahead, get your firearms, and make sure they are, oops if I can hold on to them, clear. We check everything off camera just to make sure we don't have any accidental discharges. Nothing in there. Hopefully you guys can see that. Nothing in that guy. Jack: So, go ahead and set that guy off to the side, and I'll start with the revolver. Most revolvers, this is as far as you need to go. I really wouldn't recommend going further than that just because once you start getting to the timing revolvers just get real crazy. So, get yourself a cotton swab and put some of that good juice on there. Then go ahead and run that down the barrel. Get it nice and clean. Do it as needed, then go ahead, and do the same thing in each one of the chambers. You have to make sure those guys are clean. That guy happened to be a little dirty. Do that on each one and then get your triangle bandage, rag, or what have you. Go ahead and wipe this guy down really good. Try and get every little nook and cranny. This guy happens to be a little old so he is getting a little rust on him, which you are going to have to go ahead and take care of. That pretty much takes care of your revolvers. Jack: Go ahead and get that guy out of the way and lets go ahead and do this semi auto. There are a lot of ways to take these guys apart. There are a lot of different versions, models. This happens to be a TP9. It works pretty much similar to Glocks and I think Smith & Wesson SD 9, SDV 9's. A lot of pistols are starting to go that way. Unfortunately, I don't have a 1911 to show you guys because there are a lot of 1911's out there and they are a little more difficult. For sure read the manual and it should tell you how to do it. So, first thing you are going to do is check the firearm. Go ahead and discharge that guy. Then take your slide off. Not too hard. Take the spring out and the barrel should just wiggle out. Then I like to spray this guy down real liberally and then scrub down with my toothbrush. Get in the little grooves. I generally don't always have a toothbrush all the time, so I generally just use my rag. It seems to get it pretty well. Do both sides, the lower and the slide. Just get in there real good. Then, I have to take this guy. For whatever reason, I get my springs real dirty. Make sure to wipe that down, wipe that guy real good. And on the exterior of the barrel. Then get yourself some cotton. A lot of people say it's easier to run this down the barrel when it’s in the firearm, put together. For whatever reason I prefer doing it this way. It's just how I like it and how I was told to do it. So, this is how I do it. Run that down the barrel. Do that as many times as you need. Go ahead and put this bad boy back together. Jack: I know on Glocks they have problems, TP9's also or anything that uses a little rail. They sometimes like to slip or jump off if you are not careful. So, be real careful when you are doing that. The last thing you want to do is break that [the little rail]. Just slide that back on and there you go. Jack: All right guys, this is Jack with Adventures With BeeGee. If you have any ideas or tips and tricks just let us know. Thanks have a good day. If you have any other cleaning tips go ahead share them. Also, if you like the blog please like us on Facebook.